In my first random pick for review, I selected a film I’d never heard of based on its cast of superb actors. 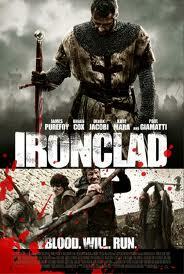 Ironclad is an exciting action film with a rich, gritty palette and bravely executed combat scenes filled with gore and glory. Well-designed, efficiently made for its modest budget, but I wouldn’t say well-directed. ‘Adequate’ is more appropriate. The film lacks requisite directorial intimacy in pivotal scenes while exposition is handled more like a dialogue-heavy Shakespeare stage play than a filmic story with keen visual moments. However, the director excels in presenting intense battle scenes—the highlight of the film—much to the viewer’s benefit. This Westernized remake of Kurasawa’s Seven Samurai has a rocky 30 minute start, after which it drastically—thankfully—improves with steady progression for the remainder of the film. Ironclad pales in comparison to the stability, complexity or thematic material inherent in Kurasawa’s version. While it is refreshing to see Paul Giamatti play the villain and, in juxtaposition, Brian Cox as a good guy (their roles are usually reversed), the protagonist (played by James Purefoy) remains inexorably weak. Without any sense of the proactive goal-seeking or depth required to drive the story, the first act feels directionless and unhinged. Unfortunately, the protagonist’s deficiencies never correct themselves. Every character ends up having more depth than and goal-orientation than the protagonist, who presents himself as the classic reactive type, acted upon instead of pro-acting to advance the plot. His only element of character turns out to be an artificial construct which neither enhances nor develops the story. Purefoy portrays his character just as weakly, like a beaten dog who tries to shrink into invisibility in order to avoid further beatings. 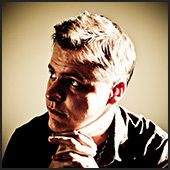 He is a non-character, and the weakest link at the core of story. Despite its shortcomings, Ironclad is worth a look if you are in the mood for a superficial action film and aren’t afraid of a little graphic violence.